What Is Hallux Rigidus & Hallux Limitus? Hallux Rigidus and Hallux Limitus are disorders of the joint located at the base of the big toe. 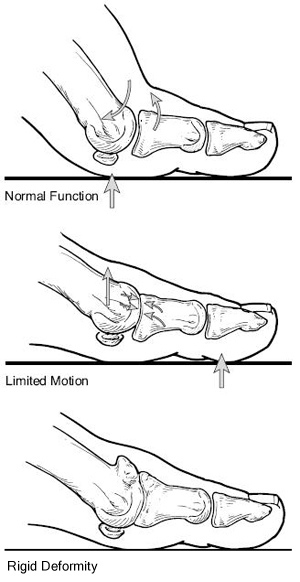 It causes pain and stiffness in the joint, and with time it gets increasingly harder to bend the toe. ‘Hallux” refers to the big toe, while “rigidus” indicates that the toe is rigid and cannot move wereas "limitus" indicates that the toes range of motion is limited. Both are actually a form of degenerative arthritis. Hallux Limitus quite often progresses to Hallux Rigidus. This disorders can be very troubling and even disabling, since we use the big toe whenever we walk, stoop down, climb up, or even stand. Many patients confuse the disorder with a bunion, which affects the same joint, but they are very different conditions requiring different treatment. 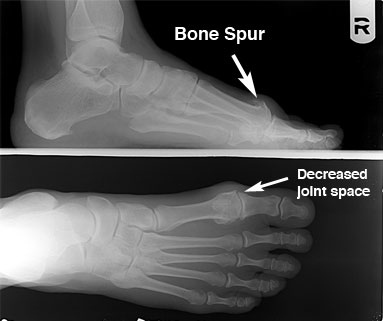 Common causes of the disorders are faulty function (biomechanics) and structural abnormalities of the foot that can lead to osteoarthritis in the big toe joint. This type of arthritis – the kind that results from “wear and tear” – often develops in people who have defects that change the way their foot and big toe functions. For example, those with fallen arches or excessive pronation (rolling in) of the ankles are susceptible to developing hallux rigidus. In some people the disorders run in the family and is a result of inheriting a foot type that is prone to developing this condition. In other cases, it is associated with overuse – especially among people engaged in activities or jobs that increase the stress on the big toe, such as workers who often have to stoop or squat. The disorders can also result from an injury, such as stubbing your toe or having a horse step on it. Or it may be caused by inflammatory diseases such as rheumatoid arthritis or gout. Your foot and ankle surgeon can determine the cause of your disorder and recommend the best treatment. In some cases, surgery is the only way to eliminate or reduce pain. There are several types of surgery for treatment of disorders. In selecting the procedure or combination of procedures for your particular case, the foot and ankle surgeon will take into consideration the extent of your deformity based on the x-ray findings, your age, your activity level, and other factors. The length of the recovery period will vary, depending on the procedure or procedures performed. Disclaimer: The advice on this website is not intended to substitute for a visit to your health care provider. We will not be held liable for any diagnosis made or treatment recommended. Consult your doctor if you feel you have a medical problem.